Since the blockchain will store confidential information (such as students' personal data, grades, and test results), public blockchain solutions that store all of their transactions in open access — Ethereum or EOS, for example — are unacceptable. At the same time, private blockchain solutions, such as Hyperledger, do not provide enough verifiability of the data stored on them. 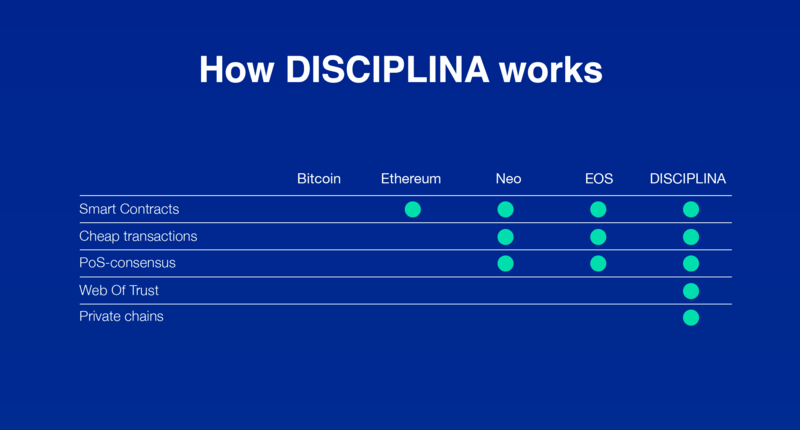 That is why DISCIPLINA is being developed as a specific blockchain to ensure the full support for the needs of the educational and recruiting spheres.